Closes the vent slide the knob to the most outward position. ?When driving on dusty roads such as tunnels or in heavy traffic, set the outside/ recirculated air mode button to the recirculated air mode. This is effective in preventing outside air from entering the vehicle interior. 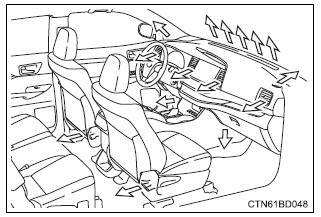 During cooling operation, setting the recirculated air mode will also cool the vehicle interior effectively. 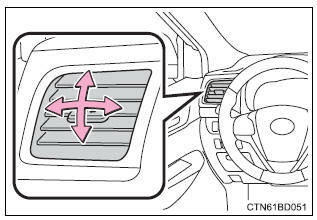 Recirculated air mode is selected as a default mode when the engine switch is turned to "on" position. 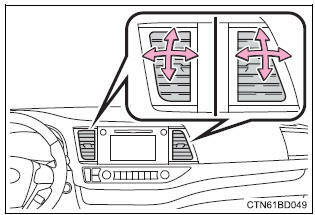 To reduce potential odors from occurring: it is recommended that the air conditioning system be set to outside air mode prior to turning the vehicle off.